“The law states that those documents will be archived and will eventually be open to the public to view, either immediately or with some delay. They will not be destroyed,” Alex Weintz, communications director for Fallin, told Oklahoma Watch in an email. View a copy of the lawsuit. The documents could be released sooner if Fallin loses a lawsuit by the American Civil Liberties Union and a media website seeking the records, but it’s not clear when that case will be resolved. If Fallin were to delay the archives release, she would be the first governor to set such a condition that state archivists are aware of, according to the Oklahoma Archives and Records Management Divisions, which keep records of historical importance. Jan Davis, administrative archivist, said she knew of no similar restrictions set by previous governors; papers from former governors usually are made public as soon as they are processed. Fallin is running for reelection this year, which means her office would turn over correspondence and other records to the State Archives as early as January 2015 if she loses, or as late as January 2019 if she wins. Her office already has archived some documents, such as event invitations, that aren’t needed for administrative purposes, Davis said. In March 2013, in response to requests from various news media, Fallin’s office released more than 50,000 records, mainly emails, related to her decisions not to create a state health-care exchange or expand the Medicaid program under the Affordable Care Act. She withheld 31 records totaling 100 pages, asserting an exemption, “executive privilege,” that does not appear in the state’s Open Records Act. Officials in Fallin’s office said the records involved attorney-client communications and private deliberations on public-policy decisions. 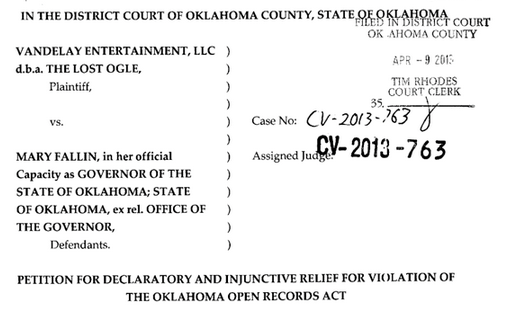 In April 2013, the ACLU, representing Vandelay Entertainment LLC, sued Fallin and the governor’s office seeking release of the records. Vandelay does business as The Lost Ogle, a satirical website based in Oklahoma City. The ACLU lawsuit, filed in Oklahoma County District Court, continues, with briefs being prepared. Under Oklahoma law, state agencies and departments must keep all records created in conducting official business; correspondence such as emails must be held by agencies for at least three years or until they’re no longer needed for administrative reasons. The agencies choose what to preserve, but no record can be destroyed without the State Archives’ approval. Agencies send records to the State Archives and, after processing, the records are made available to the public. The Archives and Records Commission, which oversees the archives and records divisions, can restrict public access to some records; typically those are materials such as sealed court cases and adoption records, Davis said. Catalogs of official papers of Oklahoma governors. The papers of Oklahoma governors through Gov. Brad Henry are available for review. Gov. Frank Keating’s records fill about 35 cubic-foot boxes, archivists said. Henry’s records fill more than 500 boxes, and about 10 percent of those are still being processed; no catalog of them has been posted online yet. Both collections are in paper form and include emails selected by the governors’ offices and printed out. The State Archives does not have a digital library online and has no capability to allow people to view records stored on computer disk. Additional funding and staff would be needed for a digital system. Electronic communications are stored on the computer servers of the Office of Management and Enterprise Services, but decisions about purging and archiving are made by state agencies and the State Archives. Brady Henderson, legal director for the Oklahoma chapter of the ACLU, said he doesn’t expect the lawsuit against Fallin to be resolved at the district court level because the losing party will probably appeal. In response to Weintz’s statements about archiving the emails, Henderson said, “Keeping the documents is better for the people of Oklahoma in the long run than destroying them. (Delaying release after Fallin’s term) still raises concerns over government transparency, though. “On the state level, governors’ files don’t require the same level of secrecy as documents concerning national security, like battlefield reports or documents about terrorism,” he said.